le húsáid na Gaeilge sna Lí­onraí­ Gaeilge atá aitheanta faoin bpróiseas. San eagrán nua den amharcóir mapa, tá eolas curtha ar fáil - i gcomhar leis an bPrí­omh-Oifig Staidrimh - ar bhonn limistéar pleanála teanga Gaeltachta mar a bhaineann sé le torthaí­ Dhaonáirimh 2011 agus 2016 chomh maith le sonraí­ maidir le húsáid na Gaeilge sna bailte a d'fhéadfadh a bheith aitheanta faoin bpróiseas mar bhailte seirbhí­se Gaeltachta, in éindí­ le sonraí­ faoi úsáid na Gaeilge sna Lí­onraí­ Gaeilge atá aitheanta faoin bpróiseas. Chomh maith le sonraí­ maidir le húsáid na Gaeilge sna ceantair seo, cuirtear eolas i láthair chomh maith, i gcomhar leis an Roinn Oideachais agus Scileanna agus leis an Roinn Leanaí­ agus Gnóthaí­ Óige faoi seach, maidir le suí­omhanna agus rollú bunscoileanna agus iar-bhunscoileanna i leith na scoilbhliana 2016/17, chomh maith le sonraí­ faoin earnáil luathoideachais sa Ghaeltacht. Fuarthas an fhaisnéis ó Shuirbhéireacht Ordanáis Éireann (OSi) agus ón bPríomh-Oifig Staidrimh (CSO) trí­ Shuí­omh Sonraí­ Oscailte Dhaonáireamh 2016 (http://census2016.geohive.ie). the use of Irish in the Irish Language Networks recognised under the process. 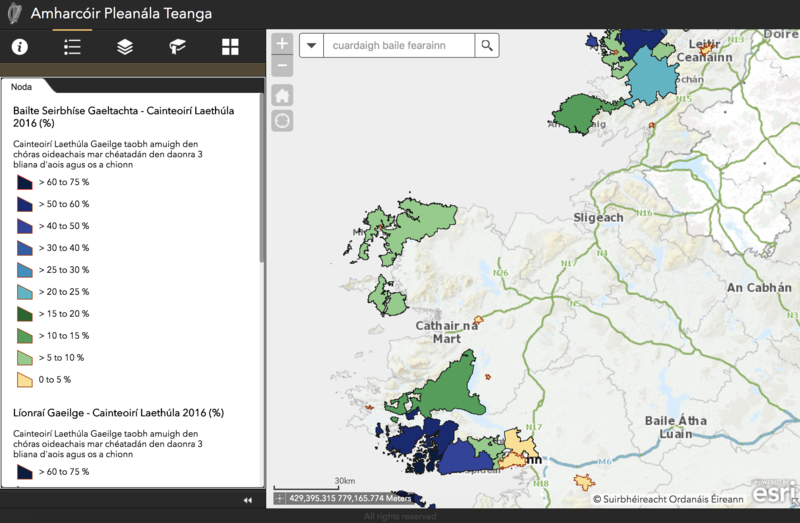 In the new version of the map viewer, information is provided - in collaboration with the CSO - according to Gaeltacht language planning areas as they relate to the results of the 2011 and 2016 Censuses as well as details on the use of Irish in towns which might be recognised under the process as Gaeltacht Service Towns, together with details on the use of Irish in the Irish Language Networks recognised under the process. In addition to details relating to the use of Irish in these areas, information is also provided, in collaboration with the Department of Education and Skills and the Department of Children and Youth Affairs respectively, on the location and roles of primary and post-primary schools for the 2016/17 school year, as well as details pertaining to the early education sector in the Gaeltacht. The information was gathered from the Ordnance Survey Ireland (OSi) and the Central Statistics Office (CSO) Census 2016 Open Data site. (http://census2016.geohive.ie).